One of the most useful phrases I’ve learned is “Let’s pretend.” It is a magical way to engage your or another’s imagination. It’s very practical when you’re in negotiations. Here’s a real world example. Years ago, I was shopping for a teak outdoor table and chairs set. I went to a vendor who had an assortment of them on display. They all had a marked price. He looked a bit stunned but I could see the wheels turning. He said, “I can’t go the full thirty but I can give you a 20 percent discount.” I bought the set at 20% off. Here’s another way I use the phrase “Let’s pretend.” When someone I’m helping is stuck in a mindset and I offer them a solution, they may say, “I just can’t do that.” I respond with, “Let’s pretend you could.” The phrase mentally transports them from where they are now to where they want to be and presents more options. “Let’s pretend” is a catalyst to move towards possibility. Lets pretend that you have a part of you that knows what’s in your best interest. By the way, you won’t be pretending. Ask that part of you on a daily basis to “protect and direct” you in whatever you do. Make it a brief meditation – a daily prayer if you will. I’m not sure this works, but let’s pretend it does. How valuable would it be to have it in your kit and caboodle? Need more choices? Let’s pretend they’re available to you. 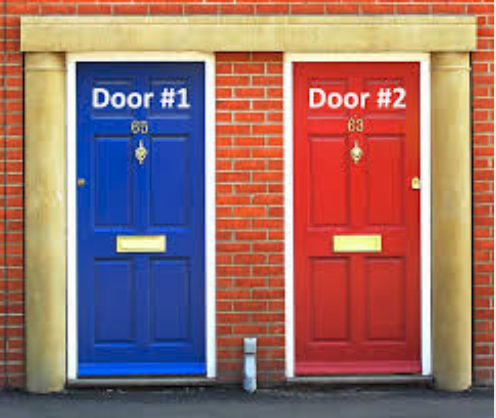 My experience is this presumption will present more options than Door #1 or Door #2.